Heroes of 2000 A.D.: Start here! It’s time to combine my two favourite things – lists, and endless adulation for 2000 AD. What’s the list going to be about? Why, the droids responsible for the enduring (and a few not so enduring) stories that have graced the Galaxy’s Greatest Comic since it began. This list is going to reveal, in order, the most prolific creators in 2000 AD history. What I aim to do is celebrate not the stories or the characters, but the creators who make 2000 AD great. I could have simply drawn up a list of who I personally associate the most with the 2000 AD style, in some arbitrary ranking of who I think is the best at it. But that would produce all kinds of nonsense! Anyway, it’s much more fun generating a list based in some kind of objectivity, especially since the results will surely surprise me – and, I hope, you too. So, I’m going to discuss these legendary creators one by one in order of ‘most’. Not best, mind, although I think there is going to be a pretty solid overlap. The hard facts in particular are: how many individual Progs/Megs/specials/peripheral publications has each creator had their work presented in? I’m aware of some obvious limitations to this method. The fact is, some creators who had a pretty major hand in making 2000 AD the creative and thrill-powered force it was and is didn’t actually contribute to many progs. And other creators toiled on/hacked out episode after episode of long-running stories that never really went anywhere, only seeing print because the schedule, or publishing overlords with no creative input, demanded it. I did make some headway toward counting total individual story-arcs featuring work by each creator - as opposed to Prog appearances - but frankly the numbers are bigger and just more fun after doing a Prog count. So, for now, I’m sticking with that as the key criterion for creating a numerical ranking. A combination of Barney, 2000AD’s own website database (when it existed a few years back), and my own collection of Progs, has helped me tally up how many bits of work any given droid has put together in service to the House of Tharg. This includes: work for 2000 AD, its specials, Annuals and other peripherals. Also, work appearing in spin-off comics: StarLord, Tornado, the Judge Dredd Megazine, Crisis and Revolver (and again, specials thereof) - generally including reprints of material originally featured elsewhere (e.g. Daily Star Dredds), but not counting reprints of material originally published in the same set of comics. But the count does not include: contributions to Action, Toxic! or the 1980s Eagle – publications listed on Barney, and sort-of from the same stable as 2000 AD. To my mind, these count as rival comics rather than sister titles, even if both were the product of many of the same minds as 2000 AD (and read by largely the same audience, once suspects). 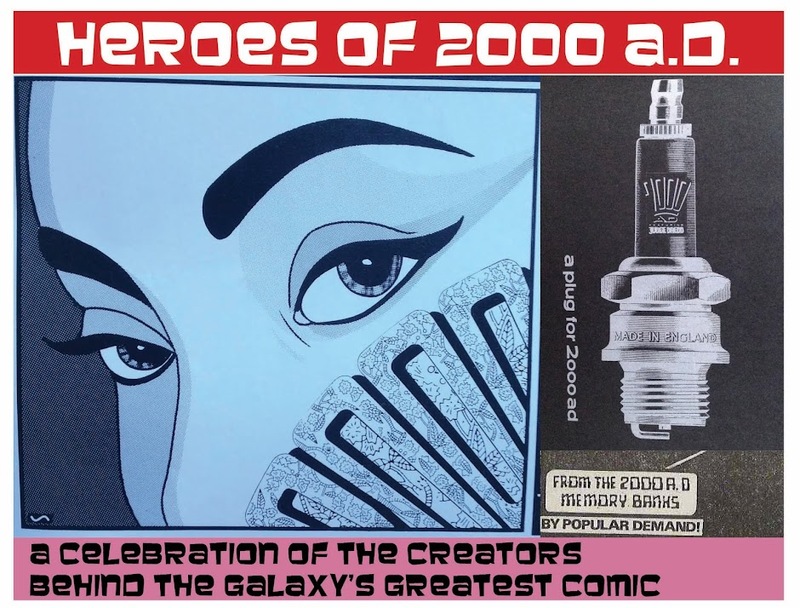 The count, crucially for artists, includes covers – partly because many of them are awesome, and partly because they help to define the qualities of any given era of 2000 AD as much as the strips inside. With a bit of detective work, I’ve also totted up any original covers featured on reprint collections, on the grounds that Tharg commissioned them for a reason, but I’ve not counted old covers that were re-used on reprints. Star scans? Well, since Barney kindly furnishes me with that info, I probably should include them, too. This is going to take a long time, isn’t it. Right, done all that adding up, time for the results! Before getting onto the list itself, please note that this will not be a traditional count down, ending at the ultimate all-time Number 1 2000 AD hero, but rather will be a count up. Indeed, it’s befitting that a comic as anarchic as 2000 AD can lend itself to such as task as a countdown and actually end up being more interesting when revealed in reverse order to the norm. Deadlock would approve. Besides, as with all such ‘lists of bests’, much of the top 10, and above all the all time top number one contributor is no surprise. How long will the list go on? Arbitrarily, I've set a cut-off at droids who've contributed to at least 20 Progs/Megs/etc. It's a long list! We’ll work our way up the list one creator at a time, with two new postings each week (providing I can keep up the pace). Hold onto your hats. Please feel free to add your own thoughts in the comments section, but remember that this is meant to be a celebration of talent, not a place to say why you hate a particular creator. I'll be making an effort to link to interviews and such, but I stress that this is purely an internet research exercise on my part. I've never met** any of the people I'll be writing about, so I'm keen to keep things polite! *Yes, comics count as art! I’ve no idea what the other 8 are, but comics are known, in some circles, as ‘the ninth art’. **I've been to a handful of comic conventions so I have, on a very basic level, interacted with a handful of 2000AD creators, a couple on a conversational level. I've even been lucky enough to work professionally with a couple of the droids to appear down the list, too, but I'll get to that when the time comes. Alex, I must be coming at this from the D C Thomson side of things as my current obsession is with Commando and I am loving the cross-over between those that have contributed to the Home For Heroes and the Galaxy's Greatest. I mean would you believe that Simon Jacob of Armoured Gideon has done three Commando comics? I would not believe it! But after checking your blog I very much take your word for it. Always nice to meet a fellow archivist/obsessive, and the Commando project is a truly epic endeavour. Loving the excuse to click through to some glorious Ian Kennedy covers.